With only three weeks left till marathon day there’s no time for slacking. Now that the holidays are done and I have enjoyed some time off, it’s now time to get back into my routine. Today I will go back to swimming which I have not done in several months. I also need to focus on my eating as I have become more flexible over the holidays. Today I made a few chicken breasts to help me get back in track. 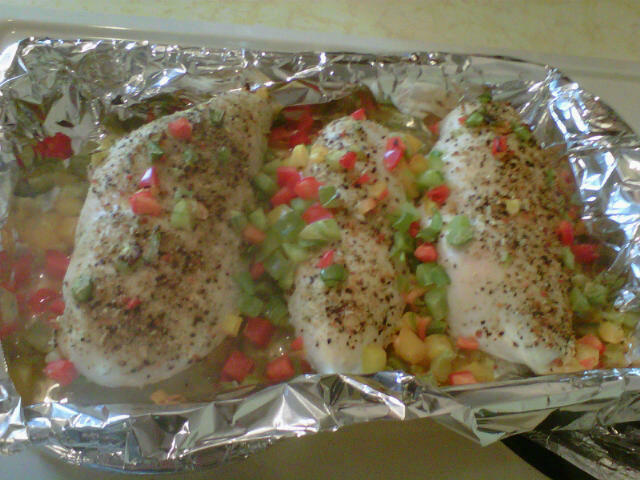 Here I cooked the chicken with just lemon juice, Mrs. Dash’s no salt seasoning and peppers (yellow, green and red). This is an easy simple way of cooking chicken. I like my food on the simple side when it comes to seasoning specially when I’m trying to really watch what I eat. This weekend I will run my last long run of training. I will try to do 23 miles! From there I will start to tapper down the mileage. Will report on how it goes. I hope everyone has had wonderful holidays and wish you all a Happy New year! I’m excited that this month I will accomplish one of my fitness goals of running a full marathon. What a great way to start off the year!